Cook onions in margarine in large nonstick skillet on medium heat 8 min. or until tender, stirring frequently. Blend in flour; cook and stir 1 min. Gradually stir in broth; cook 5 min. or until thickened, stirring constantly. Add 1 cup shredded cheese and pepper; cook and stir 1 min. or until cheese is melted. Remove from heat. 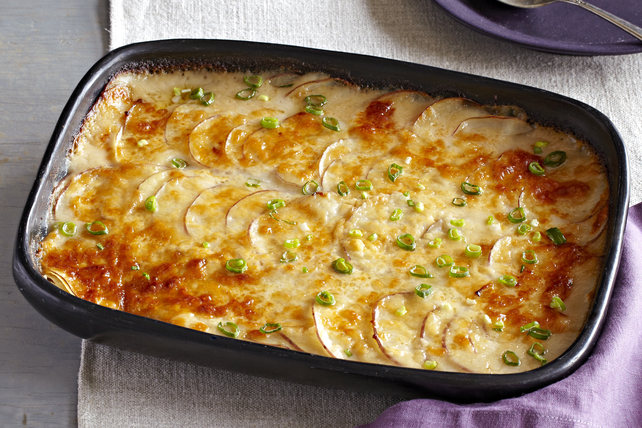 Layer potatoes alternately with cheese sauce in 2-L casserole dish sprayed with cooking spray, ending with sauce. Top with remaining shredded cheese and Romano; cover. Bake 1-1/2 hours or until potatoes are tender and top is golden brown, uncovering for the last 15 min. Top with onions. Substitute Cracker Barrel Shredded 4 Cheese Italiano Cheese for the Swiss cheese.